I LOVE the Fall. Just when you think you can't take another day of heat, Fall shows up. After a summer of bizarre weather, I was so ready for the crisp air, falling leaves, ﻿and warm colors. We don't have many more leaves on the trees but I will savor each one while I can. This sketch challenge just seemed right to showcase my favorite set "Gently Falling" from the Holiday Mini. A touch of gold Smooch completed the effect I wanted. The card was simple to make but has great "Wow" factor. 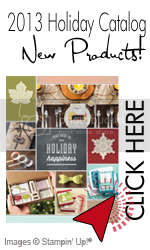 All supplies are Stampin" Up! and can be purchased on my Stampin' Up! website. More card designs and details of this weeks Stampin' Queens Sketch Challenge can be found HERE. Come join in and I look forward to seeing your designs. All products used are Stampin' Up! You can purchase these through my online store HERE. Paper: Very Vanilla, Early Espresso, Pool Party, River Rock, Spice Cake DP and Frostwood Lodge from the Holiday Mini. It is Stampin' Queens Sketch Challenge day and I loved creating this card! I have no idea how an idea comes into my head when I see a sketch but this one came in fairly complete and I am really happy with how it turned out. Gotta have some coloring (was not too hard to shade) and adding dimension adds even more interest. But the excitement doesn't end here. All supplies Stampin' Up! and can be purchased from my website by clicking here. Tags: Dark and Dreary, Halloween, Out on a Limb, SQSC9, Stampin' Queens Sketch Challenge, Stampin' Up!